Citta della Pieve, Hotel Vanucci. The waitress came towards us, whispering to herself under her breath so she could hold the message in English until she could spit it out to us. “Mr. Peter, I have a message from the chef for you. He said to tell you, ‘Since you are a man of your word, he is a man of his word.’ Your crème brûlée will be ready for you at dessert.” She looked relieved. I understood this — having held Italian phrases in my head until I could deliver them. There is a new chef at The Vanucci. The previous chef always knew when Peter was coming for lunch– Peter would book in a day or two ahead, even in the seasons when there was no danger of not having a table. It is Peter’s way. It is the proper thing to do. And the previous chef also did the proper thing: prepared crème brûlée for Peter and his guests, as a treat, without being asked. Crème brûlée is never on the menu. Yet, it always appeared when Peter did. And now, it seems, the tradition may continue. Last night, Peter booked today’s luncheon. Last night, the chef had promised crème brûlée if Peter showed up for his reservation. The waitress left us, and Peter muttered, “What’s this chap thinking? The crème brûlée should have been prepared a long time ago. If he’s just getting to it now, it will be hot, not proper crème brûlée at all.” Here, clearly is a connoisseur of crème brûlée. While I was indeed a crème brûlée virgin. I had never had crème brûlée before, and was delighted to experience this treat for the very first time. Peter Hurd, my friend and neighbor, is the vicar at the Anglican church here in Citta della Pieve. Peter — referred to as Mr. Peter or Father Peter by townsfolk. Peter is well known by sight and style, in town. 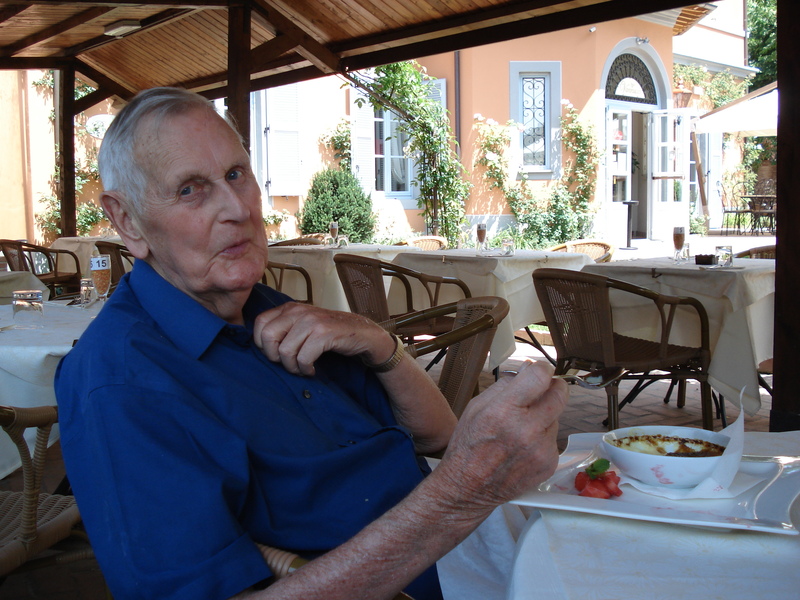 Lunch was lovely — we were eating outside in the garden, by the giant bayleaf tree, where in 2005 I saw the now-absent chef come out during dinner, cut off some leaves from the tree, and go back in to his cooking. I had no idea bayleaves could also be shade trees! Our entries were delicious — cold cumcumber soup with yogurt (and a touch of fresh garlic), and taglialini with tartufo nero (fresh black truffle shavings). Followed by the much anticipated crème brûlée. 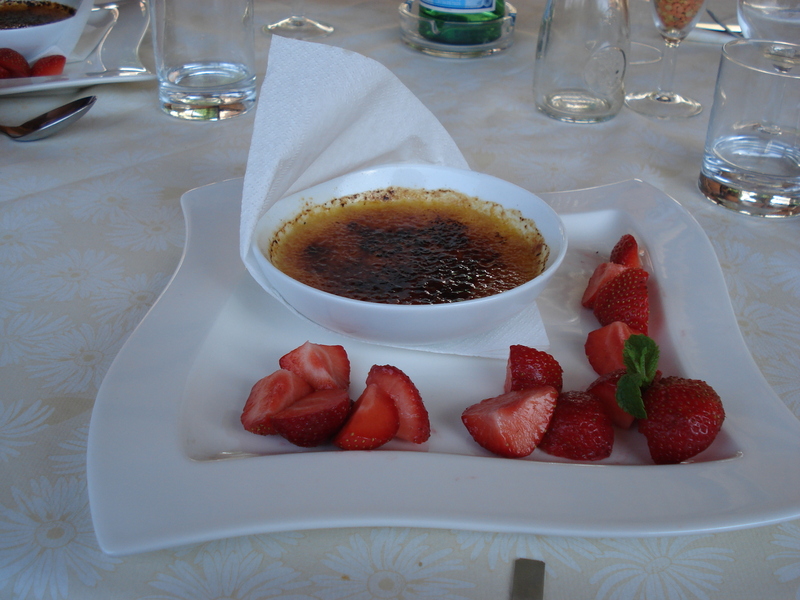 The waitress returned–would we like fragiole (straweberries) with our crème brûlée? “Indeed, please! –and on the side” (a la Meg Ryan from her When Harry Met Sally days). I figured, if this was a special order, I could be a bit high maintenance and “on the side” just to change up my style. Indeed, there was a playful high maintenance in this chef-vicar exchange. Each seemed to be enjoying rising to the occasion. In fact, it was the “rising to it” which helped make it an occasion! If you request the best from someone, they often exceed your expectation. For me, such was the case. The crème brûlée arrived with a small parade — the waitress beaming, strawberries on the side, the crème brûlée with a small paper “hat” for flourish. And then, after a pause, the chef, to check our reactions. Peter was correct — it was still warm. Also delicious. The crust thin, cracked to the spoon. The crème not too sweet, nicely thick, a good texture. I can see why Peter likes it. Sign up for the podcast! If we’ve been taught to credit our successes externally and debit our failures to ourselves, we’re indeed in a bin. It is important to come to an authentic assessment of our talents and strengths, speaking from our center.